If you want to look for market trends, the best place will be the Traffic Overview report in Traffic Analytics. Step 1. Enter domains of the key market players to get insights on the market. You can compare up to 5 websites at a time. 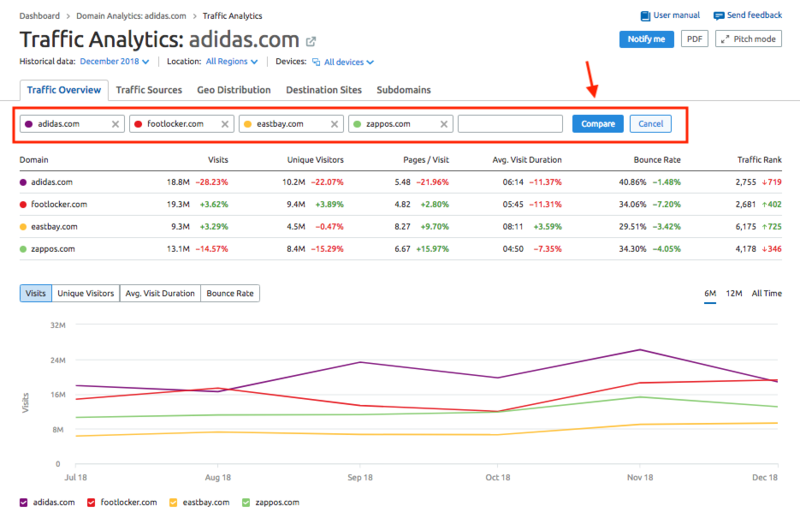 In this example, we used nike.com, adidas.com, eastbay.com, and reebok.com. Step 2. Look at the 6 months, one year, or all time (dating back to April 2016) trend of a competitor’s traffic. Keep in mind that you can compare trends for total, mobile, and desktop data. Step 3. Consider the seasonality of a trend in relation to the website. Are there spikes or dips in the summer season or holiday months? This would make sense if the business deals with a seasonal industry like clothing or products that could be gifted during the holidays.